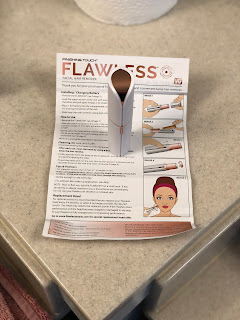 This Christmas I was gifted a Finishing Touch Flawless Women's Painless Hair Remover . I was looking for a tool that was easy to use and that would give my face a smooth feeling when finished. I have a small area of unwanted hair on my chin. Over the years I've tried tweezing, waxing, shaving and threading... none of which are ideal. So lets dive right in and try this new product. Finishing Touch Flawless Women's Painless Hair Remover ... an As Seen on TV product. 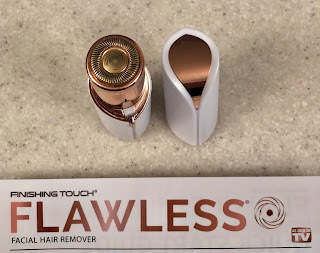 The Flawless facial hair remover by Finishing Touch is a new beauty device that erases hair instantly and painlessly without the irritation that usually comes with tweezing, waxing or threading. 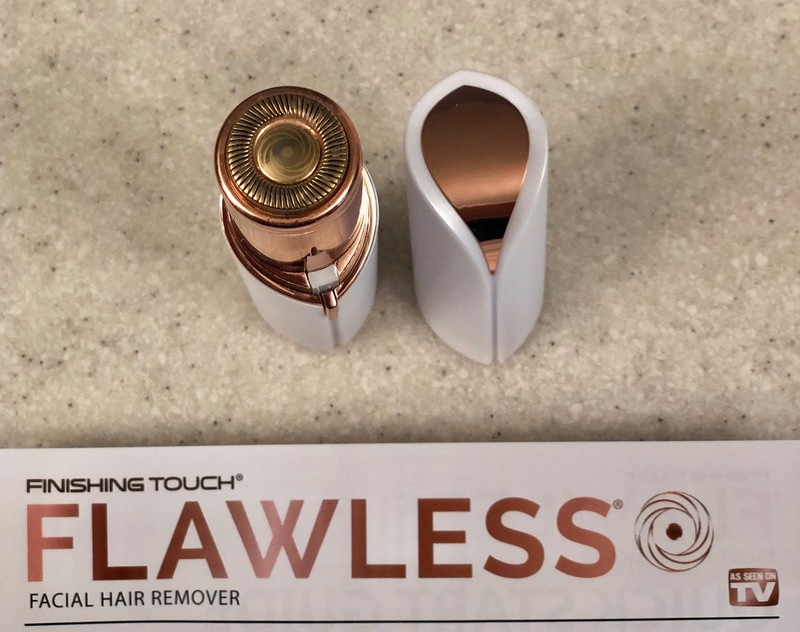 It is discreet, designed to look like a lipstick container and contains the finest German engineered technology that microscopically removes hair. The hair remover features an 18K gold plated head, is hypoallergenic and gentle on all skin types. Product has a built in light to help see small areas around the upper lip, cheeks, chin or eyebrows. Promises that you will not get any nicks, burns or irritation. I specifically wanted to use this product on my chin as that is where I have unwanted hair. I let the unwanted hairs grow out a little without using any other hair removal tools. After opening the package all I had to do was insert one AA battery. Now the product is ready to use (super simple). I quickly read through the directions and it said to use small circular motions. I placed the Finishing Touch Flawless Women's Painless Hair Remover on my chin and started to "shave" in small circular motions. I barely felt anything on my face. It was gentle and not as loud as standard electrical shavers. The size was perfect to grip and made it easy to use. I could hear the hairs being shaved off. This product was really easy to use and comfortable. After using this product my face felt smoother and the hair was removed. It was gentle, easy to use and I got the desired results. Below: Before and After photos. After using the product the following day the hair started growing back. This product should only be used if you want quick results. The following day I could see all of the stubble and the area was no longer smooth. Your hair will regrow very quickly. You will also need to replace the head of the shaver every 3-4 months. You can buy the Facial Hair Remover Replacement Heads here. Yes I recommend this product for those looking for quick results. If you have an event or date and need a quick touch up then this product is perfect. If you are looking for long lasting results this is not the product.